The beautifully elegant and historic Faust Hotel has quite a history to tell. 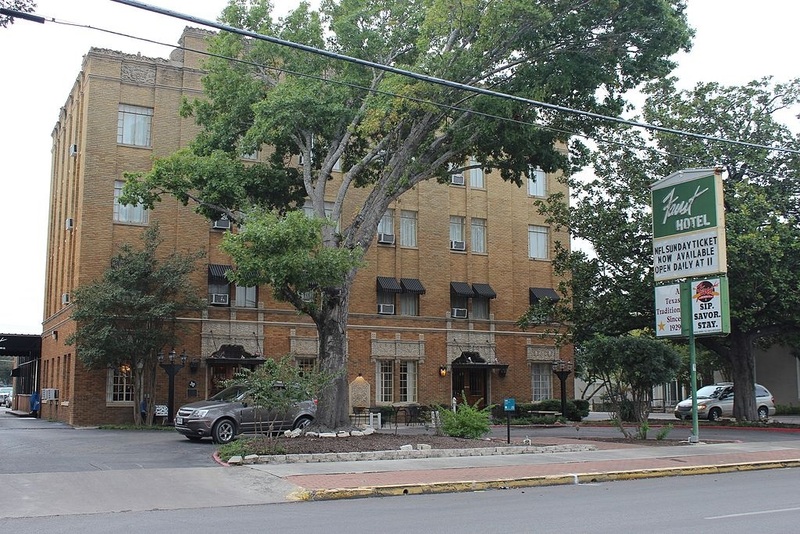 It was built in 1929, and originally called the Travelers Hotel, and it soon became the favorite spot for honeymooners from the nearby bases in San Antonio during World War 11. When first opened it was dubbed the most elegant and and best hotels in Texas. The project was spearheaded by Walter Faust Sr., in 1929. Two weeks later, came the stock market crash of 1929. It struggled through the depression like most of the country, and remained open mainly due to the determination of Mr. Walter Faust. The hotel was renamed after Mr. Faust in 1936. The Faust Hotel has experienced numerous owners. In 1985, the Faust Hotel hosted a celebration to dedicate its recently acquired Texas Historic Landmark plaque as well as placement on the U.S. National Register of Historic Places, of which I was fortunate enough to do the research and was instrumental in getting the historic landmark, along with Gary R. Cattell , and Mr. John H. Roberts, a San Antonio Executive. In the fall of 2009, The Faust Hotel and The Faust Brewing Company were acquired by Powerohm Properties, LLC. This company is an affiliate of Powerohm Resistors, Inc., an electrical manufacturing company. With a vision to preserve and restore The Faust Hotel to its Historic 1930's era ambiance, while implementing modern amenities to maximize guest comfort, the Managing Partner, Vance Hinton began the necessary repairs and renovations to The Faust Hotel in the fall of 2009. I have heard so many stories about the Faust Hotel being haunted, and I can tell you for certain, that I do believe there are spirits that wander through the hallways. I worked there in the 1980's as the Assistant General Manager, and there were many nights that I witnessed spooky things occurring that had no reason. For instance, once when I was in the bar, I was counting the nights proceeds, it was about 1;30 A.M. I heard someone coming up the stairs from the basement. Thinking I was the only one in there, I went to the basement door, and opened it, only to find not a soul there. I heard this several times, so I picked up all the money and my paperwork to go to the front desk to finish my work. All Of the sudden, the garbage can lid, started spinning around and around and around. It would not stop, I quickly got out of there, locked that door, turned in my money to the front desk clerk, told her what happened and went home. Came back the next morning to finish my work. That was just one of the things that happened while I worked at the Faust. The Bar manager said that inside the bar, glasses have fallen on their own, and kitchen staff have seen the apparition of a man believed to be Walter Faust wearing a black trench coat and a black hat. Current workers say that guests are constantly telling them about things they see or hear while staying in the hotel.